A person get ups and downs in his life like that in domain name industry a domain name also get ups and downs during his life cycle. In domain name industry daily near about 50,000 domain names gets expired. You can get these expired domain names at Expired Domains. There are total 5 stages from which a domain name have to pass in his life cycle. So if you are going to register a domain name then you should keep in mind that it was previously registered or not and if it was previously registered then it was Blacklisted Or Not. Before start building a business on your new domain name check its Blacklisting Status. If in this stage your domain name is available then you can buy it from Domain Name Registrar. You can buy if from Domain Name Registrar for 1 to 10 years period. This is second stage of domain name lifecycle. In this stage the domain name already registered and can developed or parked. A parked domain name you can purchase from its owner by sending a email to him. A Developed Domain name name can also be purchased if owner is interested. If a developed domain name is Micro Niche Website then there are chances of selling a domain name with website. A branded domain name can also be in active stage because people purchase branded domain name and submit it to site that sells branded domain name like BrandBucket. Renewal is the stage where a domain name owner can renew his domain name if he want to keep it for more time. For the renewal of the domain name we need pay some charges to domain name registrar like Name Cheap and you can renew your domain name for 5 years or more. If you have activated auto renewal system in your domain name registrar account then your domain name will be automatically renew by deducting money from your credit card which you have saved in your account. 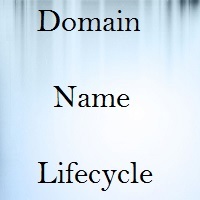 Thus a developed domain name lies in the second stage of domain name lifecycle. This is the third stage of a domain name lifecycle. Your registrar sends a mail to your for renewal of your domain name if you will not renew your domain name then it will be expired. A expired domain name will be deactivated after the 24 hours of expiration time. It means that you will not be able to see your domain name because registrar have deactivated it. You can also activate it by paying money to your domain name registrar. The expiration time is around zero to one and half month. This is called the Redemption Period or fourth stage of the domain name life cycle. After completion of expiration period the domain name comes into grace period. This is 30 days period of a domain name. In the grace period of a domain name the registrar remove every information of the domain name. It is very hard to get back your domain name from grace period because charges of doing so are very high.This is 30 days period. This is also known as the final stage of a domain name. This is 5 days time period. In these 5 days the domain is deleted from the registry. In these 5 days of deletion stage you need to wait for to elapsed this time period. After this time period a domain name get back to available stage or first stage. Thus this was all about the life of a domain name or Domain Name Life cycle.